The relationship between the religious characteristics of Hispanics and their political views often closely mirrors the relationship between religion and politics among the general population. Hispanic evangelicals, for example, tend to be more conservative than are Catholics and much more conservative than are seculars when it comes to their political ideology, attitudes on social issues such as abortion and gay marriage, and views of the war in Iraq and sympathy for Israel. Frequency of church attendance also is closely correlated with more conservative views on these issues. While evangelical identity and frequent church attendance are closely associated with conservative positions on some issues, the pattern does not hold for all issues. Views on the death penalty illustrate this point. Latino evangelicals, for instance, are no more likely than are Catholics to express support for capital punishment, the politically conservative point of view on this issue. And among evangelicals and Catholics alike, frequent church attendance is associated with higher levels of opposition to the death penalty. Religious differences among Latinos also are less evident on other issues. On economic issues, for instance, Hispanics generally support government-guaranteed health insurance for all citizens. Latinos from a variety of religious backgrounds also largely support a larger government providing more services even if it results in higher taxes. At the same time, Latino Christians do not see government as the sole solution for social ills. Almost half of Latino Christians believe that social ills would take care of themselves if enough people were brought to Christ. Religion is not the only factor that helps to explain the ideological orientation and policy views of Hispanics. Nativity, language and other factors also play a significant role. For instance, Latinos who are foreign born and those whose primary language is Spanish tend to have more conservative views on gay marriage and abortion. Those who were born in the U.S. and those whose primary language is English tend to be more liberal on those issues. But even when these demographic factors are taken into account, religious variables are often strongly related to views on social and foreign policy issues. 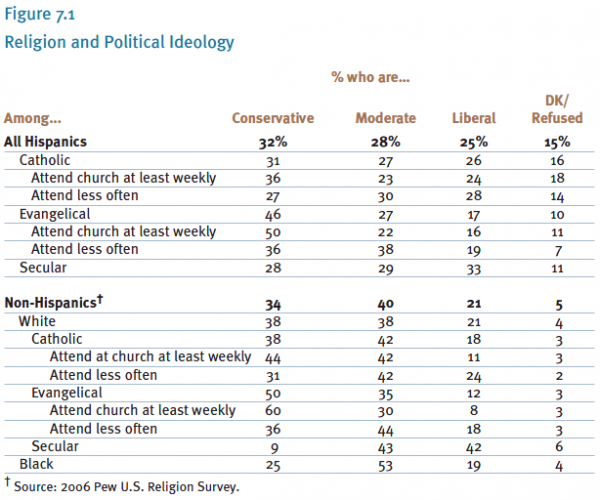 Hispanic evangelicals are significantly more likely than other Latinos to describe themselves as conservative. Latino Catholics, by contrast, are evenly divided across the ideological spectrum. Among both Catholics and evangelicals, those who attend church frequently tend to be more politically conservative than those who attend church less often. These patterns closely resemble results from surveys of the American population as a whole. The 2006 Pew U.S. Religion Survey found that half of white evangelicals describe their political views as conservative or very conservative, compared with 38% among white Catholics and only 9% among white seculars. Seculars, on the other hand, are much more likely than any other group to describe their political views as liberal or very liberal. As with Hispanics, the Pew survey finds a strong association between frequent church attendance and increased political conservatism among non-Hispanics, Catholics and evangelicals. The difference between Hispanic evangelicals and those who adhere to other religious traditions is also reflected in views on social issues such as gay marriage and abortion. While the overwhelming majority of Latino evangelicals (86%) oppose legalizing gay marriage, Catholics are more divided. A slight majority of Catholics (52%) say they are against gay marriage, but a significant minority (32%) favors it. 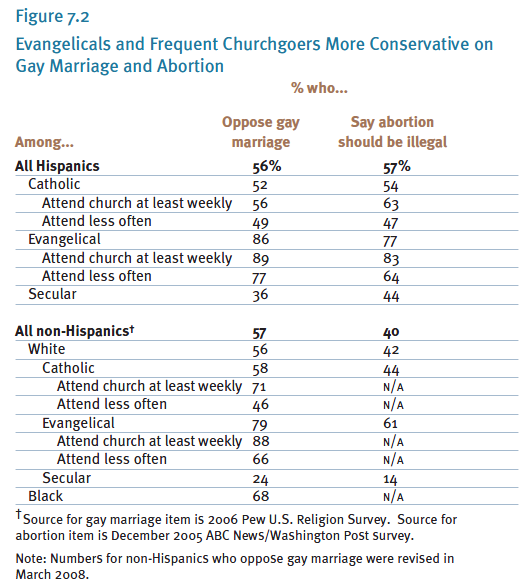 Similarly, Latino evangelicals are more than 20 percentage points more likely than Catholics to say that abortion should be illegal in most or all circumstances. These differences, to a striking degree, also occur among the general population. Just as religious affiliation helps shape the views of Latinos on these social issues, church attendance also plays a role. In the study, evangelicals who attend religious services at least once a week are significantly more likely to oppose gay marriage and abortion than are evangelicals who attend church less often. The same is true among Catholics. Of the two issues, however, abortion is the one that reveals the greatest difference between weekly churchgoers and those who attend less frequently. This study confirms that Latinos whose primary language is Spanish tend to be more conservative than are others on abortion and gay marriage. Similarly, those who were born in the U.S. have more liberal views on gay marriage and abortion compared with immigrants. Country of origin also plays a role. Central Americans, for instance, stand out for their conservatism on both abortion and gay marriage. Cubans tend to be more conservative than some other Latinos in their views on gay marriage but more liberal when it comes to abortion. But even after these important demographic factors are taken into account, religious affiliation and behavior are still closely related to views on gay marriage and abortion. For instance, even after controlling for language ability, country of origin, generation and education, statistical analysis reveals that Latino evangelicals are significantly more conservative on both issues compared with Catholics. Catholics, in turn, are more conservative than are seculars in their views on gay marriage, although not in their views on abortion. Frequency of religious attendance, too, is associated with more conservative views on social issues, especially among Catholics. Hispanics’ views on foreign policy issues also resemble those found in the general population. 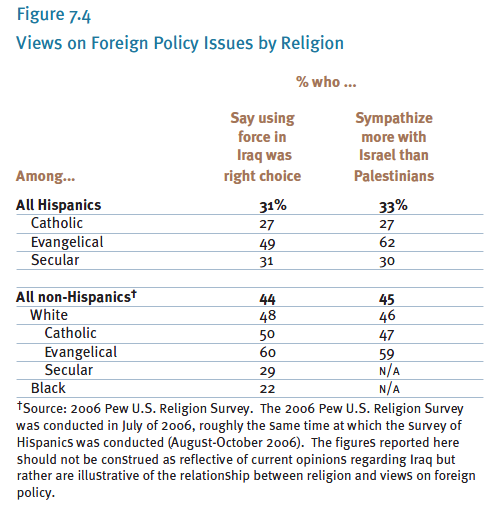 Latino evangelicals, for instance, are more supportive of the war in Iraq than are other Latinos. Nearly half of evangelicals say that using force against Iraq was the right decision, compared with 31% among seculars and 27% among Catholics. Previous Pew polling reveals similar differences among the population as a whole. The divide between evangelicals and Catholics on the war in Iraq is even more pronounced among Latinos than it is among the general population, even after controlling for partisanship. Support for the war was 28 percentage points higher among Latinos who are evangelical and Republican than among Catholic Republicans and 16 percentage points higher among evangelical Democrats than among Catholic Democrats. Hispanic evangelicals, like their white counterparts in the general population, are very supportive of Israel. More than six-in-ten (62%) support Israel over the Palestinians, far more than among Latino Catholics or seculars (27% and 30%, respectively). Indeed, the gap between Hispanic evangelicals and Hispanic Catholics on this question is roughly three times as large as the gap between white evangelicals and white Catholics. These differences may reflect the importance of the fate of the Jewish people for evangelical theology, which foresees a prominent role for Israel — and the Middle East region more broadly — in the events that eventually will accompany the battle of Armageddon and the end of the world. About one-third of Latinos (34%) say they sympathize with neither Israel nor the Palestinians, while 18% express no opinion on the matter. Evangelicals are less likely than other Latinos to express no opinion on this question or to say they support neither side in the conflict. While evangelical identity and frequent church attendance are closely connected with conservative positions on social issues such as gay marriage and abortion, this pattern does not hold for all issues. For example, Hispanic evangelicals, who stand out for their conservatism on gay marriage and abortion, are no more likely than Catholics or seculars to favor the death penalty for people convicted of murder. In fact, evangelicals are slightly more likely than Catholics to oppose capital punishment. And, among Catholics and evangelicals alike, frequent church attendance is associated with opposition to capital punishment— which is widely seen as a politically liberal point of view. Catholics who attend church at least once a week are more likely than Catholics who attend church less frequently to oppose the death penalty (46% vs. 36%), and evangelicals who attend church at least once a week are 11 percentage points more likely to oppose capital punishment than are those who attend less frequently. The Catholic Church opposes the death penalty, and the U.S. Conference of Catholic Bishops has been campaigning since 1980 to end its use in the U.S. Regardless of religious tradition, Latinos take liberal views on economic issues, often in contrast to their conservatism on social issues. More than two-thirds (69%) of Latinos support publicly funded health insurance for all citizens, for instance, even if this results in higher taxes. On this issue, there is virtually no difference between Latino Catholics and evangelicals. By contrast, Catholics in the general population are somewhat more likely than evangelicals to endorse publicly funded health care. Similarly, almost two-thirds (64%) of all Hispanics, including similar numbers of Catholics and evangelicals, say they would opt for higher taxes if the result were more government services. Behind this support is the high level of sympathy Latinos express for the plight of the poor. 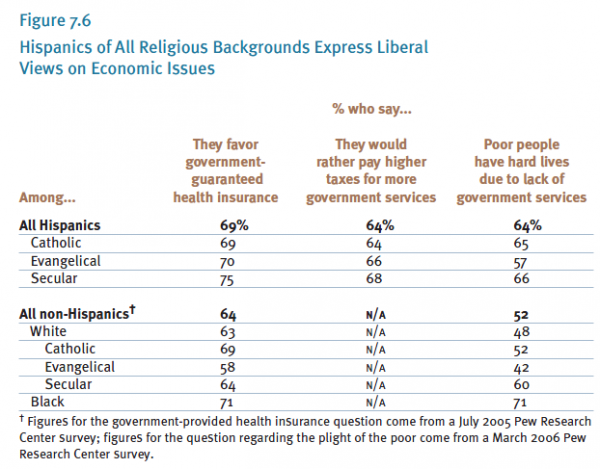 Nearly two-thirds (64%), including large majorities of Catholics, evangelicals and seculars, agree that poor people have hard lives because government benefits do not go far enough; a substantially smaller majority (52%) of non- Hispanics agree with this statement. Fewer than one-in-three Hispanics, by contrast, say that poor people today have it easy because they can get government benefits without doing anything in return. Differences of opinion on economic issues are not strongly related to nationality. 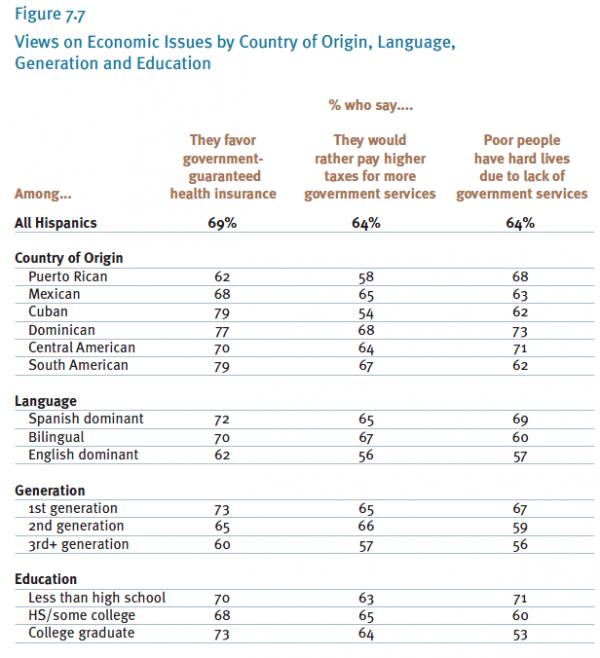 Puerto Ricans express less support than other groups for government-guaranteed health care, and Cubans have a less favorable view than others of a large government providing many services. But there are no consistent patterns that suggest nationality leads to consistently more liberal or conservative views on economic issues. Though Hispanics largely support an active role for government in providing for the needs of citizens, they do not see government as the only source of solutions for social and economic problems. Indeed, about half of Hispanic Christians (47%) believe that social ills would take care of themselves if enough people were brought to Christ. And while there are few differences across religious groups in views on economic policy issues, there are differences in level of support for the view that social ills would take care of themselves if enough people were brought to Christ. That view is held by a large number of Catholics (45%) but is particularly common among evangelicals (60%). Among Latino Catholics, regular church attenders are somewhat more likely to hold this point of view than are those who attend less frequently.